Pizza Hut has done the unthinkable. "It's real," tweeted Pizza Hut. "Hot Dog Bites Pizza." The photo also depicts squeeze bottles of French's classic yellow mustard, in what is possibly the first depiction ever of pizza with mustard. Apparently, the pigs in blankets can be snapped off the pizza by hand and dipped, individually, into the mustard. 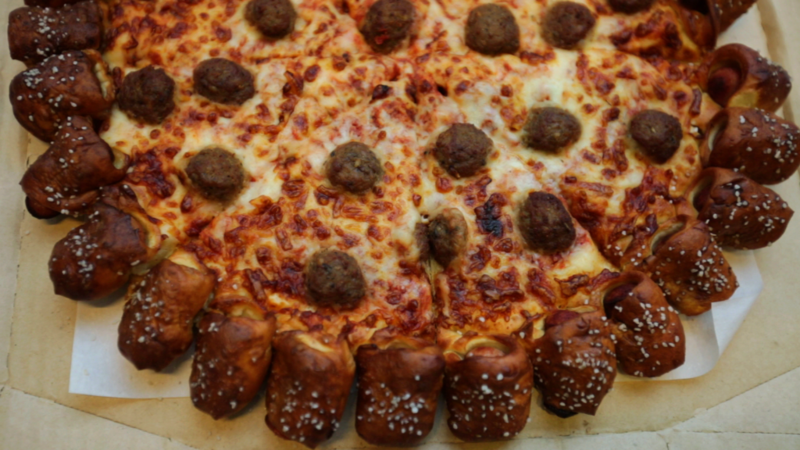 Pizza Hut tweeted the date that the pizza will be available (June 18) along with the hashtag #HotDogPizza. 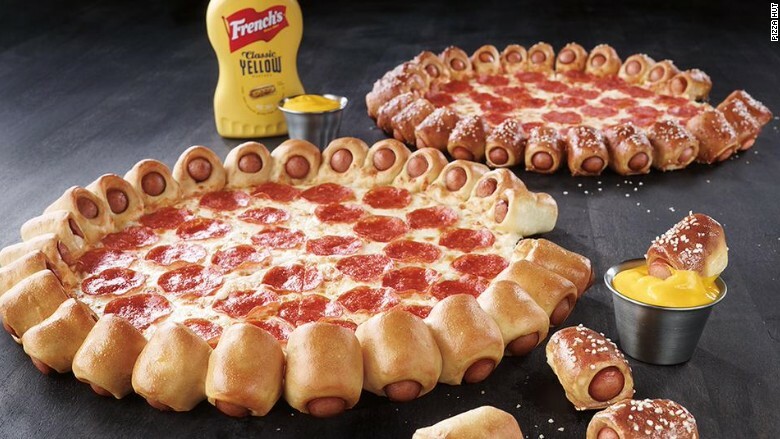 Behold ... Pizza Hut unveils the hot dog pizza. It's the only pizza you can eat with mustard. Calorie counters should know the hot dog pizza is 460 calories per slice, or 3,680 calories for a typical eight-slice Pizza Hut pie. This is just the latest in fast food chains periodically unveiling weird, eye-catching products to draw in consumer attention. The most famous, or infamous, example of this is the Double Down from KFC. This was a bacon and cheese sandwich with fried chicken for buns instead of bread. Pizza Hut and KFC are both owned by Yum Brands! (YUM), which also owns Taco Bell. No stranger to controversy, Yum recently announced a bold new experiment with Taco Bell. Yum said that a Taco Bell in Chicago will start selling booze along with its burritos and gorditas. Along with beer and wine, the restaurant will fortify frozen drinks like Mountain Dew Sangria Blast and Starburst Strawberry. Just last month, Yum also said that two of its restaurant chains are shedding artificial additives. Taco Bell promised to get rid of artificial ingredients and trans fats by the end of the year. Pizza Hut vowed to get rid of artificial colors and flavors by the end of July.